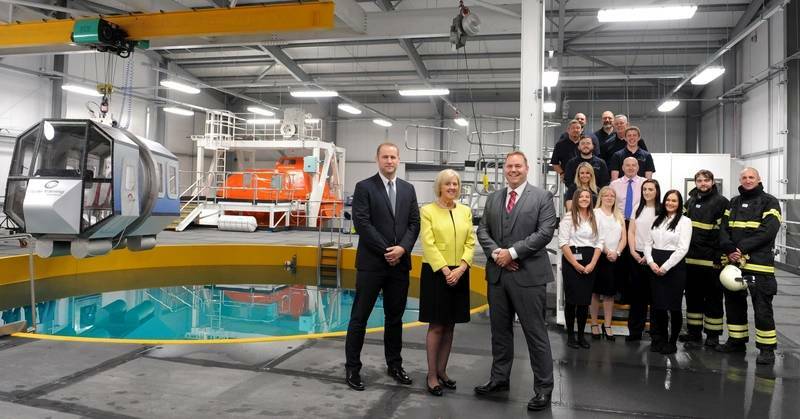 Clyde Training Solutions (CTS) opened central Scotland’s first dedicated marine and offshore international training centre. CTS – a newly established Clyde Group company - is now offering an extensive range of onsite accredited maritime safety courses to an international market at its new complex on the banks of the River Clyde in Clydebank. Phase one of operations at the centre has created in the region of 30 jobs with potential operational growth likely to create future employment. The centre offers multiple classrooms, dedicated deep-water pool, HUET (Helicopter Underwater Escape Training module), and full fire training ground complete with training stack and helideck, all within easy reach of Glasgow Airport and Glasgow city centre. Accredited courses aimed specifically at the offshore and oil and gas industries are soon to follow. Colin McMurray, CTS Director, said: “I am delighted to say the first phase of operations at Clyde Training Solutions’ new purpose-built training facility has begun in earnest. “This facility can match any of the top marine and offshore training centres in Europe, with our accredited maritime training offering now conducted by our specially selected team of experienced industry trainers. “Soon we will also be offering courses dedicated to the offshore and oil and gas industries, at our accessible Greater Glasgow location. “We are working with international training standards providers, such as OPITO, in order to deliver mandatory safety training required for those working on offshore vessels and oil and gas installations. Courses from the Standards of Training Certification and Watch keeping (STCW) are accredited by Marine Coastguard Agency (MCA).